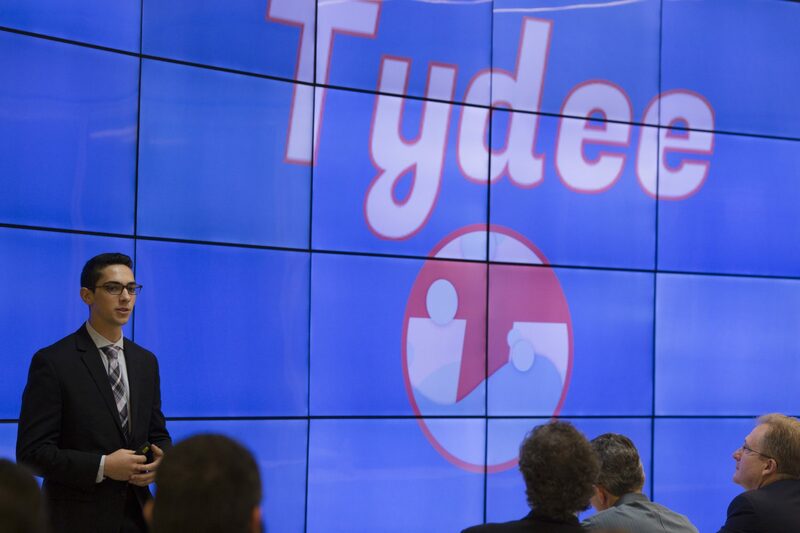 Tydee Laundry CEO Zachary Burr pitches his business idea before Indiana University Research and Technology Corp. CEO Tony Armstrong (lower right) and two other judges during the second annual B-Start Demo Day competition held Thursday evening at IU’s Cyberinfrastructure Building. (Photo by Chaz Mottinger | IU Communications). A finance major at IU’s Kelley School of Business has won the second annual B-Start Demo Day business pitch competition, held Thursday evening at IU’s Cyberinfrastructure Building. Zachary Burr, who offers subscription and on-demand laundry and dry cleaning services through a venture called Tydee Laundry, earned the top prize of $2,500 through the strength of his business proposal and a five-minute pitch he made before a three-judge panel. Placing second and earning $1,500 was Christopher Podlaski’s Plant Software, an automated, web-based intelligent scheduling platform. Third place and $500 went to Wes Wagner, whose company Intask offers a modern platform to find, manage and use student free-lancers to accomplish intern-level work. All nine participating teams received a $500 stipend to continue their business development. B-Start is a program of the Bloomington Economic Development Association. Graduation stipends and pitch prizes provided through financial support from IU’s Innovate Indiana initiative, Cook Group and the Gayle and Bill Cook Center for Entrepreneurship at Ivy Tech Community College-Bloomington.